Actually, they were more than a bit of a nuisance. 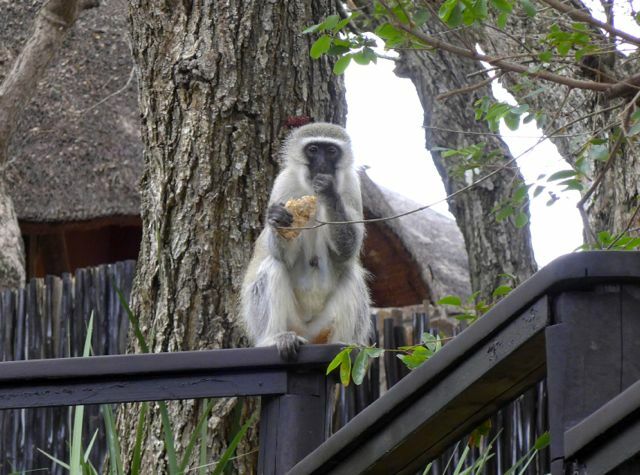 Having a dozen monkeys hanging out in the nearby trees just waiting for the butlers to simultaneously head to the kitchen for dishes so that they can swoop down to the deck in a matter of seconds and take something from the buffet table, or if particularly cheeky, from a guest’s table, sounds like an amusing thing. It really isn’t. But we are in THEIR space too, so we all have to be a bit tolerant I suppose. After a post-wake up call mini-breakfast of tea, coffee, scones, muffins, granola, muesli and yoghurt, then a mid-drive refreshment of tea and coffee (with amarula — a local creamy Bailey’s like liqueur) some fruit, biscotti, etc. 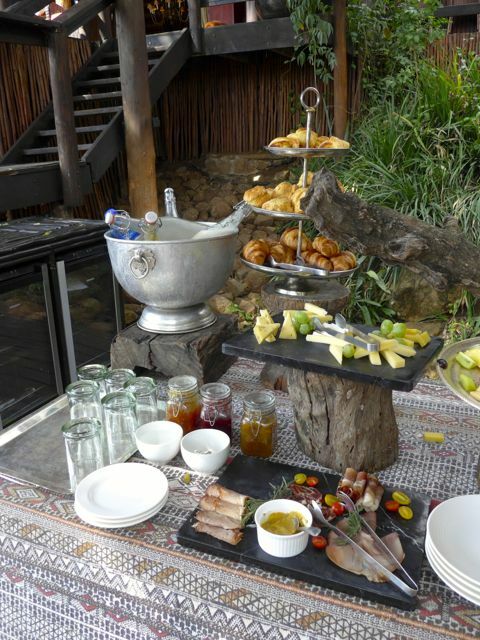 we return to our villa, freshen up and head to the deck for a hearty breakfast at say 930-10am each morning. 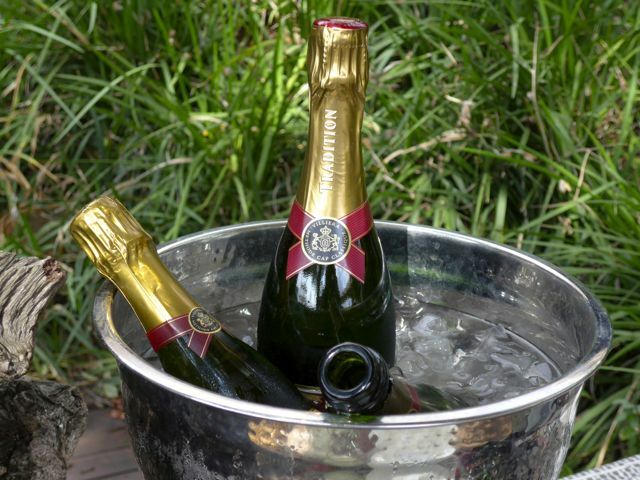 Bottles of bubbly (they can’t technically call it champagne as it isn’t from Champagne) that they refer to as methode cap classic are on ice and we sometimes had that mixed with freshly squeezed orange juice for a very refreshing mimosa to start our meal. Butter in chilled ceramic crocks are brought around, and we select one of several gorgeous apparently homemade jams, preserves or marmalades. Apricot and orange marmalade being my favorite of the bunch. A bread basket with 2-3 kinds of toast arrives second later, and pots of tea (once your choice was known, it was brought on succeeding mornings unless you indicated otherwise) or coffee or in the case of our daughter a banana milkshake made its appearance as requested. 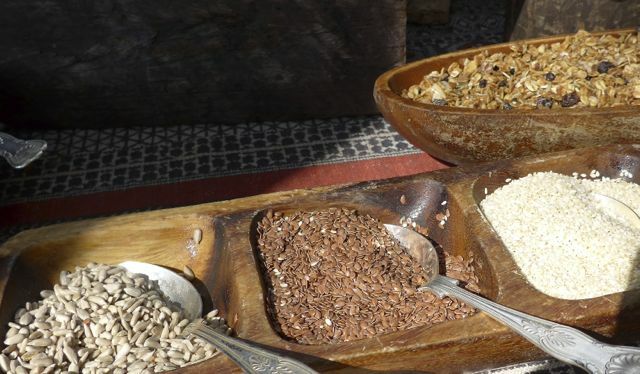 …while a selection of cereals, seeds, grains are at the other end. 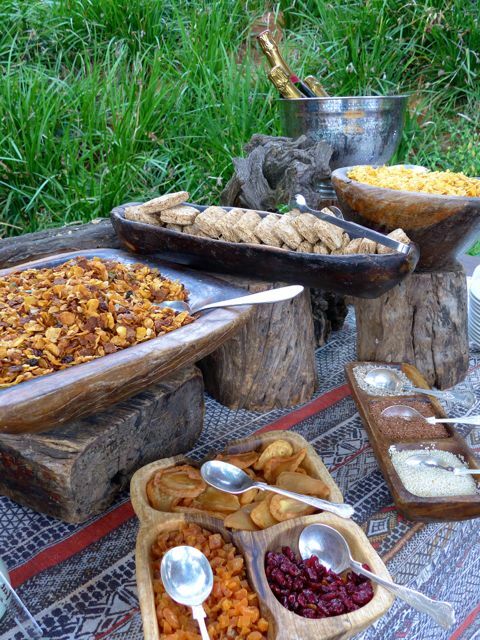 Note the use of old stumps of wood and the incredible serving vessels carved out of wood. Spectacular and totally appropriate to the setting. The silverware brings you back to the privileged setting. A beautifully presented selection of fruit is on a silver platter and I had to take this picture because I am always intrigued by the lengths to which chefs abroad stretch to cut fruit into unusual shapes and pull it all together into a terrific trompe l’oeil or still life. The mixture of colors was also so vibrant and appealing, even if you knew the fruit had probably travelled some hundreds if not thousands of miles to get there! We talked briefly to the chefs one day and learned that supply lines for spectacular produce was not always so easy. Today, with so many luxury hotels and camps in the area, refrigerated trucks make the long journey from major supply cities and the camps/hotels have their pick of stunning raw materials. My fruit plate one day, with the figs as the standout of the selection. 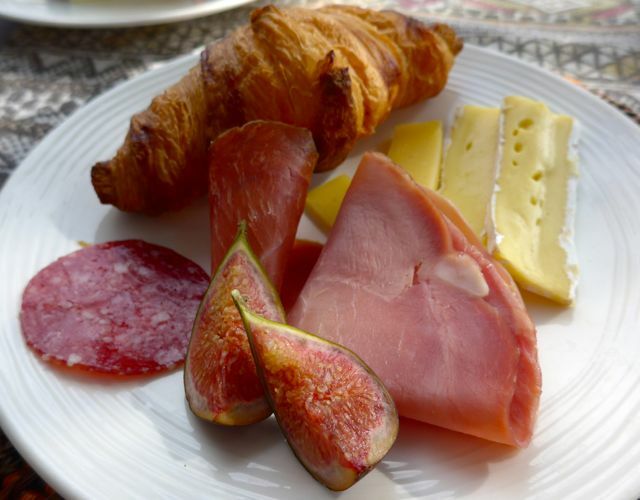 Had I not been so overwhelmed by all the other choices, I should have requested 8 figs and taken as many slices of ham/prosciutto and just had THAT for breakfast along with some champagne! 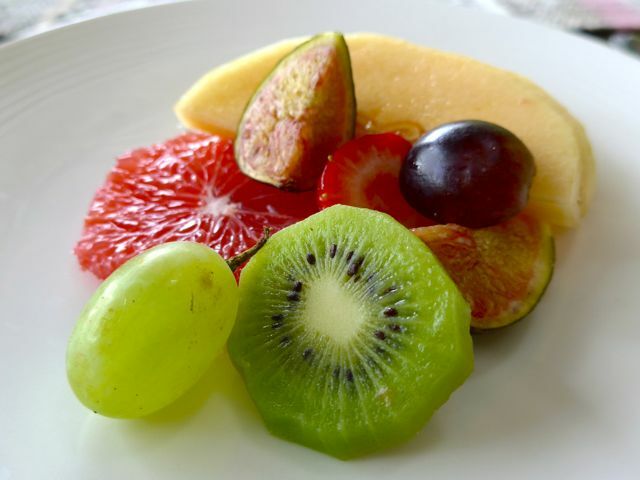 Another day’s fruit plate, withs some unusual cactus fruit amongst the choices. 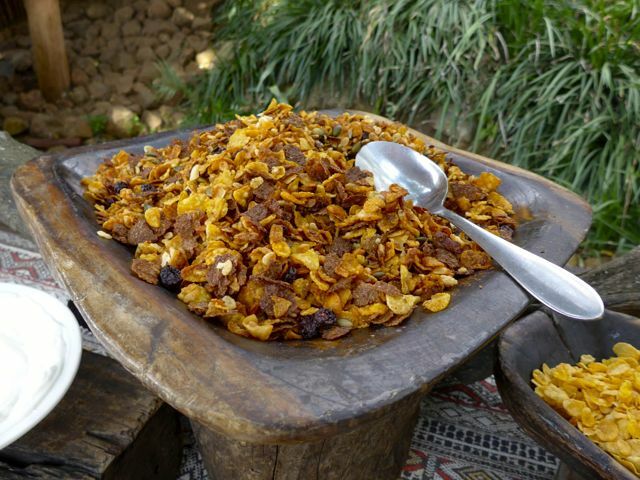 It was sweet and juicy, with crunchy seeds or seed pods in the middle. Some rustling in the underbrush nearby made us look over the edge of the deck, to spy this enormous monitor? 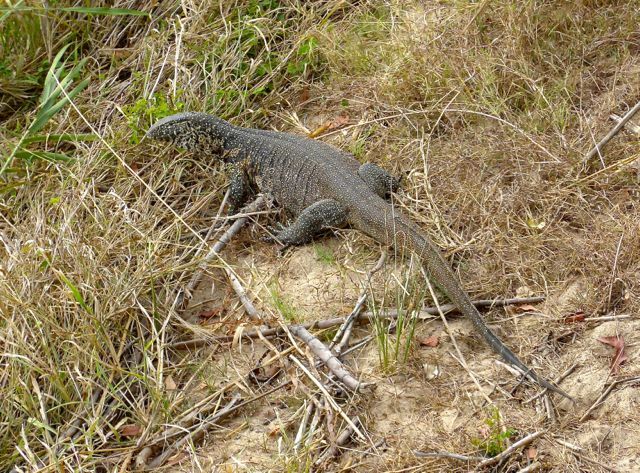 lizard (bayawak cousin?) moving along. 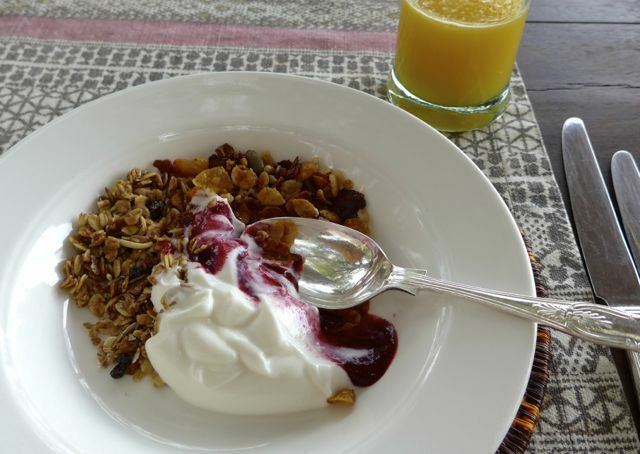 …along with good greek-style yoghurt and perhaps a dollop of raspberry or plum sauce. 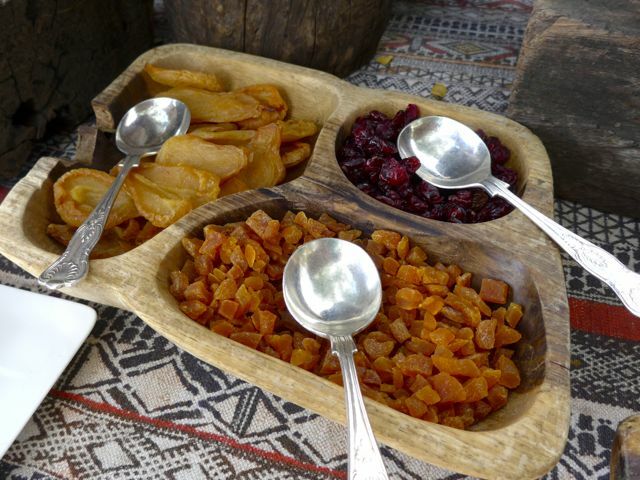 The selection of dried fruit in South Africa is superb, and they even have a lot of dried mangoes as well, locally grown. 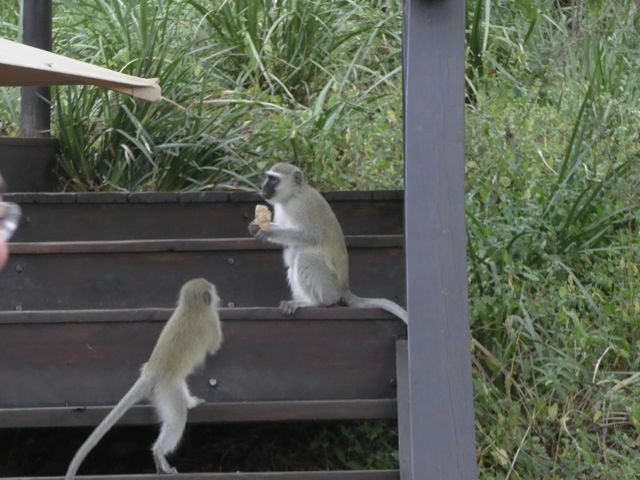 The monkeys seemed partial to the multi-grain hard crackers and an occasional croissant or two. At one breakfast Mrs. MM had a buck rarebit, a variation on welsh rarebit but with spinach. It had a couple of slices of superb bacon, eggs, a whole grain slice of bread and a cheesy sauce on top. Delicious. 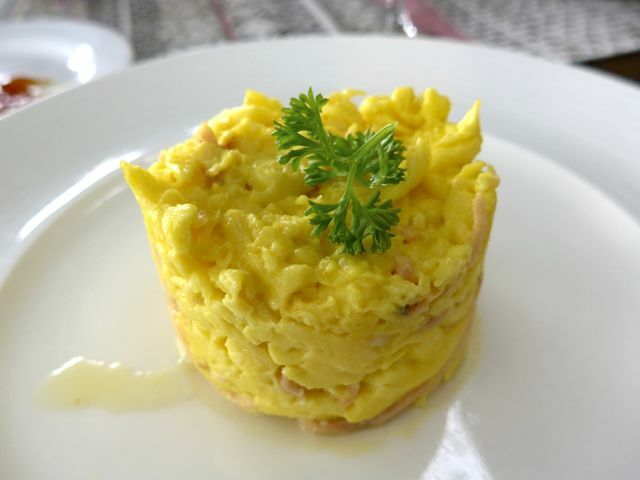 I had a dish of kippers and scrambled eggs that I assumed would come separately rather than cooked together, but it was toothsome nonetheless. I noticed a tendency to cook the eggs drier than usual, so if you preferred otherwise, remember to say that before your next breakfast order was placed. 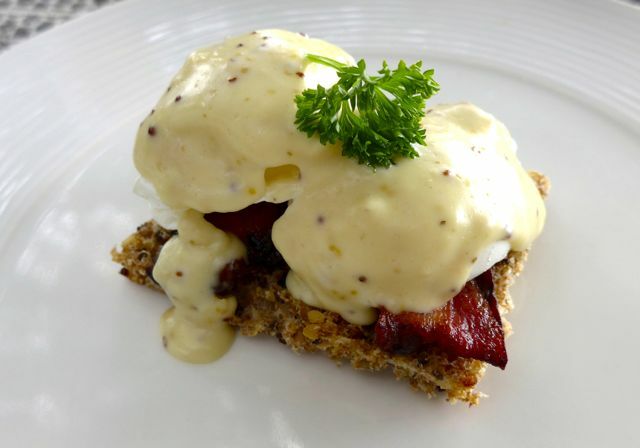 Daughter’s eggs benedict was superbly executed, and Mrs. MM and I would also order this on succeeding breakfasts. A generous portion with two poached eggs, ham, bread and sauce meant we simply COULDN’t be that hungry for lunch some 2-3 hours later! 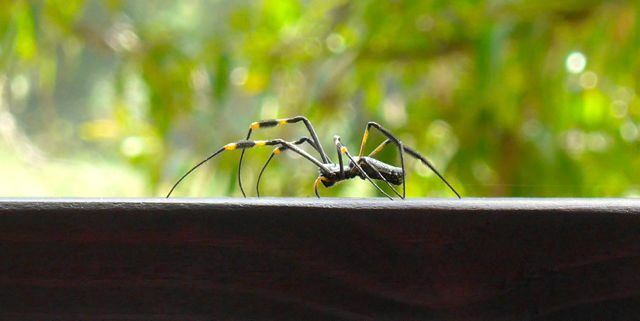 On our last day, this rather menacing looking spider crawled across the handrail just in front of our table, and ginormous bees took a dip in Mrs. MM’s tea cup. …of which I partook with some cheese after my fruit plate each morning. 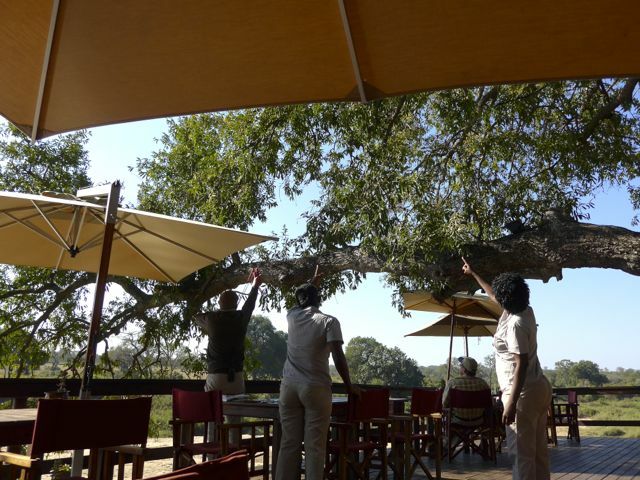 …butlers trying to scare them off with a slingshot. At first, they just let go of the rubber without any stones or “bullets” but the monkeys figured that out quickly. So now they actually do use pebbles, but don’t aim to hit. 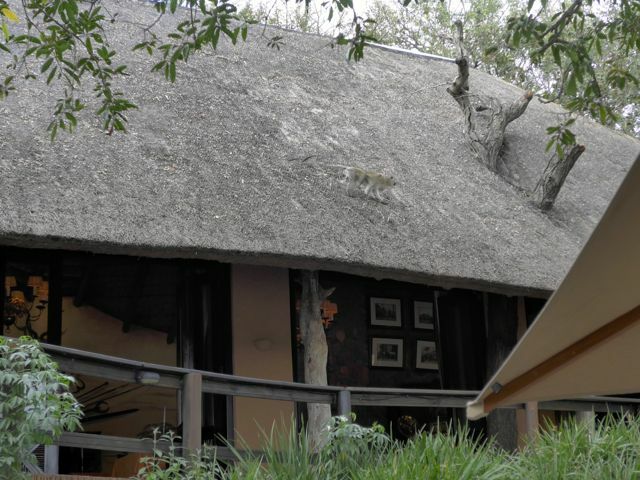 We had slingshots in our villas in case we needed them as well. Thanks for letting us come with you on your fantastic journey. Madamo gid nga salamat! Champagne for breakfast? Wow! 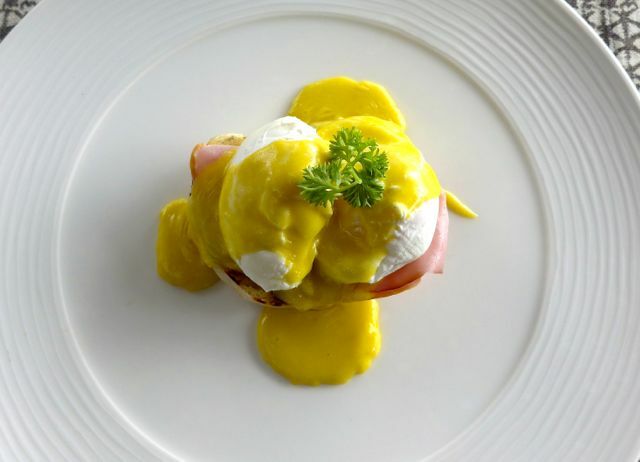 The eggs Benedict looks delicious! Ha, ha, ha, those monkeys. 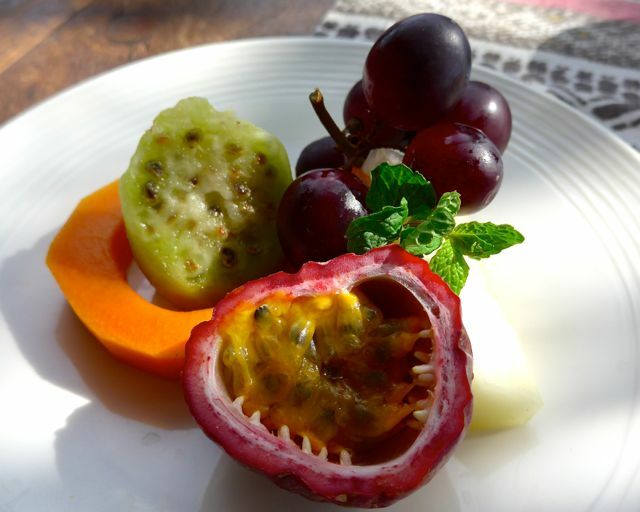 I wonder if the passion fruit ( luscious slices of the purple variety in your plate) is locally grown and I wouldn’t be surprised, the northern part of South Africa being in about the same latitude as some of the northern countries of South America where it is native to. Lately , I have been seeing the yellow variety at the Centris market as well. Wow, Wow, Wow–Impressive trip! Everything is simply just wonderful–feel na feel ko talaga. Bless your heart always for sharing your family’s such amazing safari. One of my favourite fruits, not only because of its name but more because of its intense flavour which is very similar to that of ripe guavas. But guavas and their pesky ground gravel seeds have a way of tightening up against you on its way out which is the opposite of passion fruit’s effect. Those slippery seeds seem to grease the skid-way for an easier more regular moving experience. They are available all year round all over Brazil and the rest of Latin America and are usually hung around the entrances of juice bars where their smooth shiny shells deflate and become gnarly and wrinkled though the interior remains the same smooth sweet-scented and slippery ready-to-eat dessert. I theorise that the eggs were dryish because they were precooked, waiting to be assembled as per order and then baked to warm through. 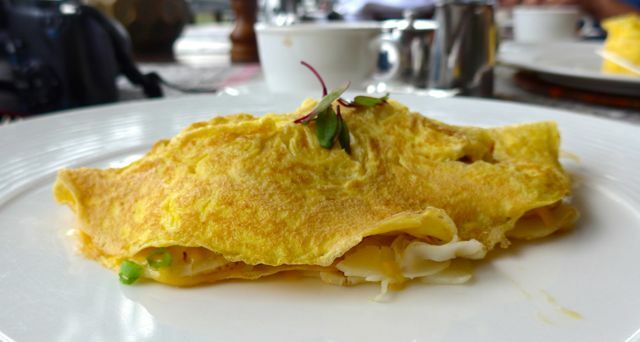 Omelettes are filled and folded while scrambled eggs are mixed with fish or whatever and stuffed into a ring. These then go into an oven or God forbid, the microwave (a major drying factor!). Even covered, they’ll still be dryish. The macuja (passion fruit mousse) is what I am passionate about. 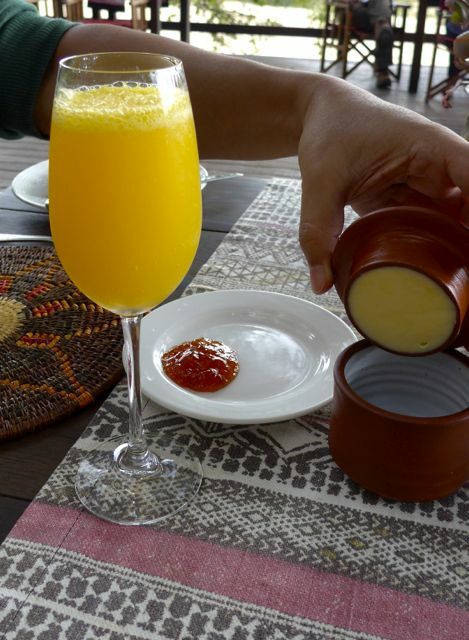 Sometimes when I do not want to discard syrup drained from fruits from the can, I mix it with some passion fruit juice. In the right dilution I get a refreshing novel cocktail juice ( no alcohol) and is a penny saver as a party drink instead of soda. @ConnieC, where is it from? 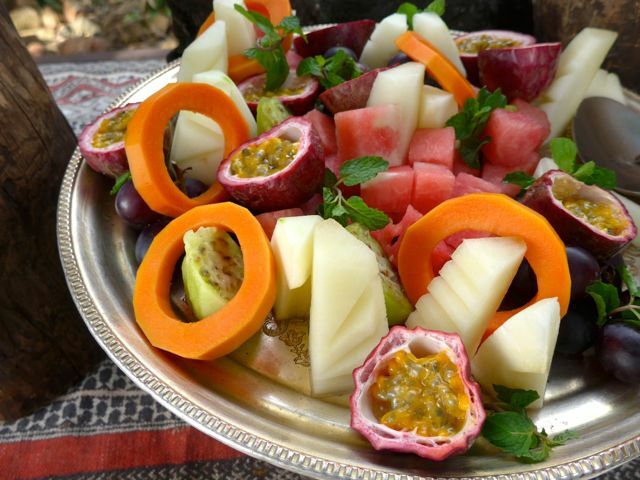 They are called maracujà in Brazil. Oops, yes, Footloose. It is maracuja. Sorry, a visual field loss and at 2 AM, just gotten out of bed pining for the mousse:) And I did not even have guavas! I had a first taste when a Brazilian friend made it for us on a visit to Rio. This topic on breakfasts and wildlife reminds me of my breakfast in Rome two weeks ago. 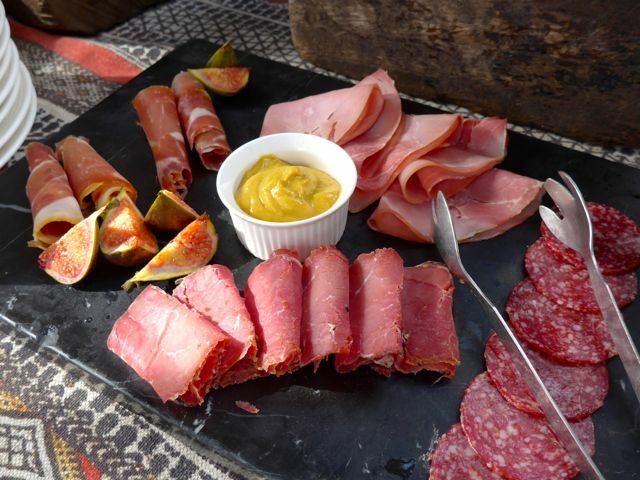 It was a roofdeck buffet, and I had set my coffee, croissant and cold cuts on our table. I go back to get other stuff when an excited guest runs to tell me that a giant bird had upset our table. It was a big seagull, and he was really aggressive, coming back repeatedly. Ordinary shooing didn’t deter him. The staff had to pretend to whack him. you had me at mimosas, but the rest of the buffet had me more! beautiful passion fruit! what’s that green fruit between the papaya and grapes, MM? My mom would love all of those fruits while I will make a beeline for the cold cuts and cheese. This post reminds me of a wonderful breakfast spread we had in Austria where I tasted one of the most delicious breads I ever. It had pumpkin seeds, walnuts, etc. Exactly the same we had during our visit. 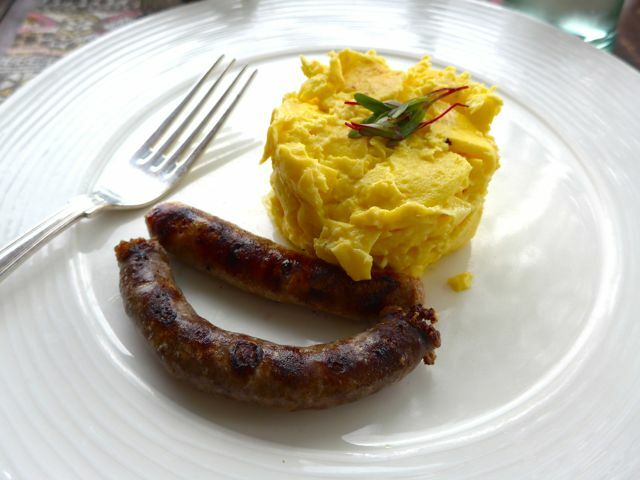 I hope they had boerwurst on the breakfast menu. I found the taste interesting. i had to look twice for the monkey prowling on the rooftop as its coloring blended so well with the roof’s and camouflaged it.